Today I decided to make two cards using one stamp set, and the two cards I’m making are both CASE’d (Copy And Share Everything) from the 2018 Occasions catalog. You might be asking yourself why I would remake cards that someone else already designed. I’m so glad you asked (thought...wondered...whatever)! Everyone has creative block now and then, even the most seasoned crafters. That’s why Stampin’ Up adds the product photos to our catalogs – to help us get new ideas and look at things in new ways. And that’s exactly what I’m doing today. I have been dying to play with my Birthday Wit stamp set but every time I sit down with it, my brain just shuts down on me. Has that ever happened to you? To save you some reading - unless you're like me and actually ENJOY reading - I'll go ahead and post the video here first. 1. I just started doing this in January, and 2. I honestly thought no one other than my kids would watch, let alone subscribe. So, I want to do something nice for you guys who keep coming back to listen to me ramble. If we can get to 50 subscribers by May 1st, I will randomly draw one subscriber's name from the proverbial hat. I will post the winner here on my blog, and he or she will receive a handmade set of cards from me. If we get to 100 subscribers by May 1st, someone will win a Stampin' Up goody pack! 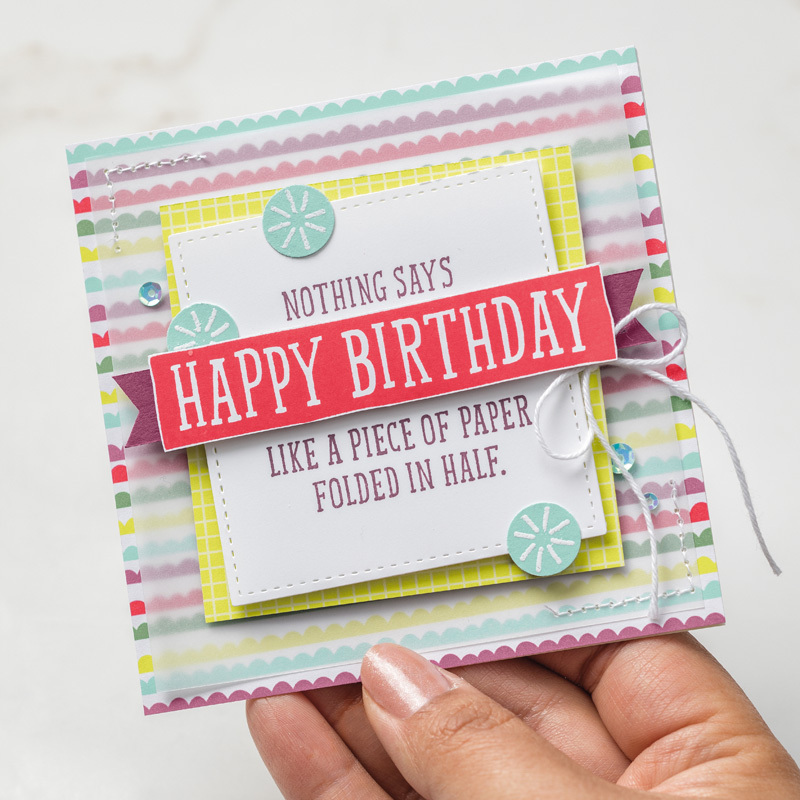 For the first card, you'll need 3 colors of ink, the Birthday Wit stamp set, and 1 piece of Whisper White, cut at 8 1/2" x 5 1/2" - scored and folded at 4 1/4" to make a side-folding card base. Stamp the "...You don't get any older that year" sentiment in your darkest color (I used Bermuda Bay) on the lower left corner of the card base. With your next darker color (I chose Daffodil Delight), stamp a few times with the star burst from the set randomly around the sentiment, and then do the same with your lightest color (Lemon Lime Twist for me). Repeat the process with the "pebbles" stamp from the set, using your lighter two colors.At this point you have a perfect respectable, very quick and easy card. If you wanted to add on it, you could put in a few sequins, add some Wink of Stella for shimmer, or do what I did, which is put in a few glittered epoxy shapes here and there, in the centers of the stars. Card #2 is a little more involved, but it's not difficult by any means. To start, you'll need a piece of Whisper White cut the same as before, only you're going to use it as a top-fold card this time, so turn it a quarter turn. Next, you'll need a couple of mat pieces. I've used a piece of DSP from the Tutti-Frutti 6x6 stack for my base, and it's cut at a scant 4 1/4" x 5 1/2". The idea is to cover the card base completely. You'll also need a piece of Tranquil Tide card stock to mach your back ground paper cut at 3 1/4" x 3 3/4", and a piece of Whisper White, cut at 3" x 3 1/2". You'll need a scrap piece of Rich Razzleberry card stock , roughly measuring 3/4" x 4 1/2", and a scrap of Whisper White to cut a sentiment from and to punch 3/4" circles out of. Let's stamp first, shall we? 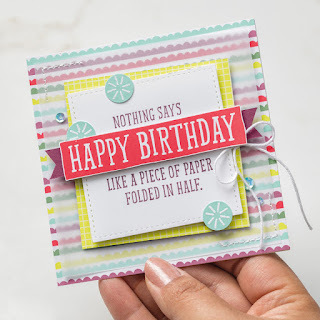 On your white strip, stamp just the "HAPPY BIRTHDAY" part of the "Nothing says Happy Birthday..." stamp using Rich Razzleberry. If you need to stamp the whole thing, don't sweat it. You're just cutting out the happy birthday part. On your white mat, go ahead and stamp that entire sentiment too. This mat is a keep, so be careful. Next, using Tranquil Tide, stamp some star bursts onto white scrap and punch those out. Put some Dimensionals on the back of the "HAPPY BIRTHDAY" and stick it down to the Razzleberry strip, centering as best you can. If it's not perfect, don't worry. Just trim the ends to be of equal distance, and then make a small slice up the center of each end. Cutting on the diagonal, go from corner to middle on all four corners. If that made sense to you, you should now have banner ends. If I mucked that explanation, watch the video - it'll help. Now it's time to stick everything down. As I said before, the patterned DSP will cover the card base. 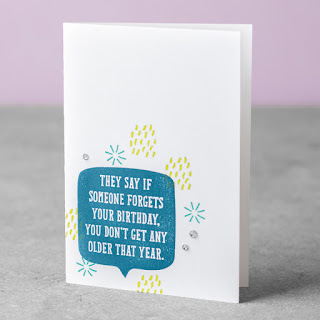 The white card stock sentiment sticks directly onto the Tranquil Tide card stock, and the Tide card stock gets to be popped up on the patterned paper with dimensionals. Use dimensionals to adhere HAPPY BIRTHDAY onto the banner you made, then use them again to adhere the whole piece right on top of the stamped sentiment. Use glue dots to adhere the star/circle punches randomly. I chose to stop there, but the example jazzed it up more with stitched vellum, sequins, and some linen thread. Very pretty! The moral of the story here kids is that our catalogs are more than just sales tools - they're idea books! Next time you find yourself in a creative slump, pull out a catalog and flip through the examples for a little inspiration. What's that you say? You don't have a catalog? Oh no! That's an easy fix. Slide over to that "contact me" form and drop me a line. I'll be happy to get the latest catalogs into your hands!